When you begin working as a teaching professional, your school district will likely offer you an opportunity to save for retirement, known as a 403b Retirement Plan. What you might not know is that you can shop around for your plan, just like any other shopping trip. Think of it this way: A little retail therapy can improve mood, boost confidence, and relieve stress, so shopping for a 403b retirement plan shouldn’t be different. You may be surprised at the release of endorphins you get when you ultimately choose a low-fee, tax deferred retirement plan! However, before you begin your shopping experience, get to know the options on the shelf; there are a lot of choices, some with missing price tags and others with confusing language and offers. It can be overwhelming, and you may opt for a word-of-mouth recommendation without knowing the facts, that ends up reducing your nest egg in the future. But by making an informed choice, you can get the satisfaction from the sale, and take control of your financial future. 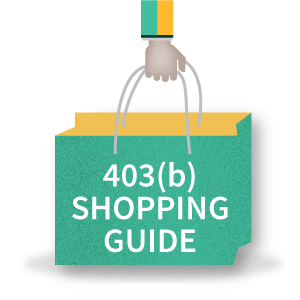 So, grab your bag, and let’s explore the 403(b) marketplace. Read on for super shopper tips that could potentially set you on track for higher returns and higher security in later years. If you get overwhelmed, don’t just close your eyes and grab the same product your friend chooses. Always seek out professional guidance and do your homework in comparing the products, because here, it’s the savvy shopper that earns the deal! • Click on the ‘Participants’ button. • In the bottom left corner find where it says Employer Plan Info and then select your state. • Type in your employer name and select it. • Click submit. BOOM! You just found your menu of participating providers! Where to start? Imagine the TPA as your mall with a map of all the shops—or providers—that your district has made available to you. 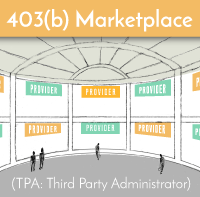 A TPA (Third Party Administrator) aggregates the 403b plan provider choices for the district clients, much like a mall that has a variety of stores for you to shop in. OMNI is one of the largest TPAs that organizes 403(b) options for teaching professionals. It provides a site in which to manage the initial designations you’ll make when you sign up for an account. New York and some other states use OMNI. As a client, you will go to the OMNI site to set up your account. Once you find your TPA (403b marketplace) you can look at the list of participating providers your district has made available to you. 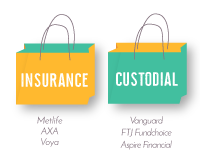 Take your time determining which providers are insurance companies offering insurance products (called annuities), and which providers are custodial retirement accounts offering mutual funds. Note that some are hybrids. Which store to hit first? Neither your school district, nor TPA, can tell you which provider to use. You must comparison shop on your own. Just as a mall contains stores, but doesn’t tell you which to go into, OMNI does the same. OMNI is a TPA that prides itself on the variety of providers it offers and can have over twenty in one district. There are names you might recognize from ads or from friends who’ve invested, and some you don’t. These are some of the companies you may see on the list: AXA, Voya, Metlife, Vanguard, FTJ Fundchoice, Aspire Financial and Fidelity. Do bigger brands or recognizable names mean better quality products? Not necessarily. You may be surprised to know that many of the recognizable names might be the ones with the least amount of savings. Custodial retirement accounts offering mutual funds. Do not just choose a product because the salesman bought you lunch at the teacher’s lounge. 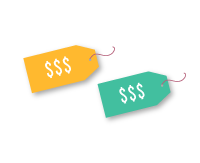 As with any purchase, be wary of relentless sales pitches that pressure you into buying a product quickly or a deal that seems too good to be true. After you have perused the menu of providers, you should brush up on what kind of products they offer. Putting in the research and work now will reap better rewards in the years to come. Remember, like anything else, the product choices are NOT equal, and this is not one size fits all. If you aren’t sure, consider consulting an independent financial professional —aka “personal shopper” to help you weed through the racks. 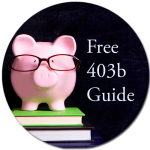 There are two main types of 403(b) products available for you to consider. MUTUAL FUNDS (also called a 403(b)(7) custodial account): This type of product allows participants to invest their contributions in mutual funds. The account is not an annuity or a life insurance product. Returns on contributions depend on the performance of the mutual funds selected. A variable annuity is a contract with an insurance company under which you contribute into a tax–deferred account. In return, the insurer agrees to make periodic payments at retirement or some future date. You can choose to invest contributions in a range of investment options, which are typically mutual funds. The value of the account in a variable annuity will vary, depending on the performance of the investment options chosen. In this sense, it is similar to a mutual fund product except it is offered as a life insurance product and involves a contractual agreement. A fixed annuity is a contract with an insurance company that guarantees a minimum rate of return during the time that your account is growing. The insurance company also guarantees that the periodic payments in retirement are guaranteed for an established amount of time. Details of the minimum rate of return and payout schedule are established when the contract is signed. In some instances, the insurance company will charge additional fees for features and guarantees. A specific type of fixed annuity contract between you and the insurance company. During the period of time where you make contributions, the insurance company credits a return that is based on changes in an equity index, such as the S&P 500 index. The insurance company sometimes also guarantees a minimum rate of return. In retirement or on a future date, the insurance company will make periodic payments to you under the terms of your contract. In some instances, insurance companies will charge additional fees for features and guarantees. What is the difference between investing in an annuity versus a mutual fund? 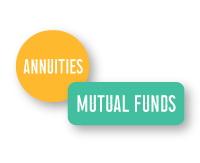 Are you aware of all the fees or commission involved, including all costs of mutual funds or variable annuity sub accounts? Do you know how you your financial advisor and the investment company you’re working with are being compensated? Does your financial advisor accept fiduciary responsibility? Are my investments being monitored by my financial advisor or someone else? How do I know if my account is properly balanced? There are potentially three layers of fees and charges that participants should be aware of. You are so close — but wait, did you take a closer look at the price tag? Before you hit the register, you must determine what it will cost to invest in your future. And it’s not always easy uncover what your future costs will be, especially when fees can be hard to find. You can’t escape investment fees. The average mutual fund fees and expense ratio is 1.02% a year, according to the Investment Company Institute. On the other hand, the annual fees on variable annuities usually start at 2% and vary up to 3%, according to FINRA. And that’s in addition to the fees that are charged by that product’s mutual funds that make up your sub-accounts. If you can’t picture that in terms of how much the fees are costing you, consider this example: Jane Smart decides to invest in a variable annuity with a 2.25% fee cost. She contributes $250 steadily for over 35 years, with an 8% average of annual return. Upon retirement, Jane has built a nest egg of $336,320. Jane is happy. But look at the numbers closer — had Jane shopped around and done her research at the time of purchase, she would have found lower cost plans that would have lower fees. If Jane had chosen a 1.40% fee plan with the same average of annual return, she would have $73,265 more in her savings. The moral of this story? Do your homework! Get out your magnifying glass and ask to see the prospectus or contract. All mutual funds and variable annuities are required to produce a document called a prospectus, which details specific information about investment cost, objective, risk, performance, and operating rules. Fixed-annuity products do not have a prospectus. Instead, they have a contract that details operation of the annuity. If you can’t make heads or tails of it then ask an independent financial professional before you sign on the dotted line. It is important to understand all fees associated with your plan before you begin contributing to any 403(b) investments. Additionally, some investments impose surrender charges or restrictions on withdrawals. Shopping tip #5: Buyers Remorse? Did you already choose a plan but now have buyer’s remorse? Don’t worry, just like shopping, there is the possibility to exchange a product. You will need to determine if there are any surrender charges or fees before doing so. Once you have done your research, selected a provider, and shopped a plan—the smart way—you can begin contributing a part of your paycheck to start your nest egg. You can access a Salary Reduction Agreement through your TPA. No amount is too small, and the fact is, you are doing something great for your future by making savings a priority. Because the income funneled into your account is tax-deferred, the IRS does set a capped amount for 403b contributions each year. There are other options for increased savings though, based on age and employment. If you can, go ahead, and max out your savings! What you do now will have higher payoff in the future. If Shopping Isn’t Your Thing, Don’t Go It Alone! Everyone knows, shopping is much better with a friend! Going alone can be time-consuming, sometimes confusing, and what’s more, the mistakes can be costly. Working with a financial advisor (aka personal shopper) is an option to consider carefully. If you have any questions, we are here to help. Investing involves risk including loss of principal. Investing in mutual funds involves risk, including possible loss of principal. Annuities are long-term, tax-deferred investment vehicles designed for retirement purposes. They are not suitable for all investors. Gains from tax-deferred investments are taxable as ordinary income upon withdrawal. Guarantees are based on the claims paying ability of the issuing company. Withdrawals made prior to age 59 ½ are subject to a 10% IRS penalty tax and surrender charges may apply. Variable annuities are subject to market risk and may lose value. Equity Indexed Annuities permit investors to participate in only a stated percentage of an increase in an index (participation rate) and may impose a maximum annual account value percentage increase. EIAs typically do not allow for participation in dividends accumulated on the securities represented by the index. Warwick Valley Financial Advisors and LPL Financial are not affiliated with any of the other referenced entities. This material was created for educational and informational purposes only and is not intended as ERISA, tax, legal or investment advice. If you are seeking investment advice. Breaking down the basics & what each part covers. Whether your 65th birthday is on the horizon or decades away, you should understand the parts of Medicare – what they cover, and where they come from. Teachers: Is the Death Benefit Killing Your Retirement Plan? Sign-up to receive periodic market updates, news, and local events. © Securities offered though LPL Financial, member FINRA / SIPC. Investment advice offered through Private Advisor Group, a registered investment advisor. Private Advisor Group and Warwick Valley Financial Advisors are separate entities from LPL Financial. This communication is strictly intended for individuals residing in the state(s) of CT, FL, MA, NJ, NY and TN. No offers may be made or accepted from any resident outside the specific states referenced.